The odds are in our favor…. I made a mistake. There should have been cake seconds all around. 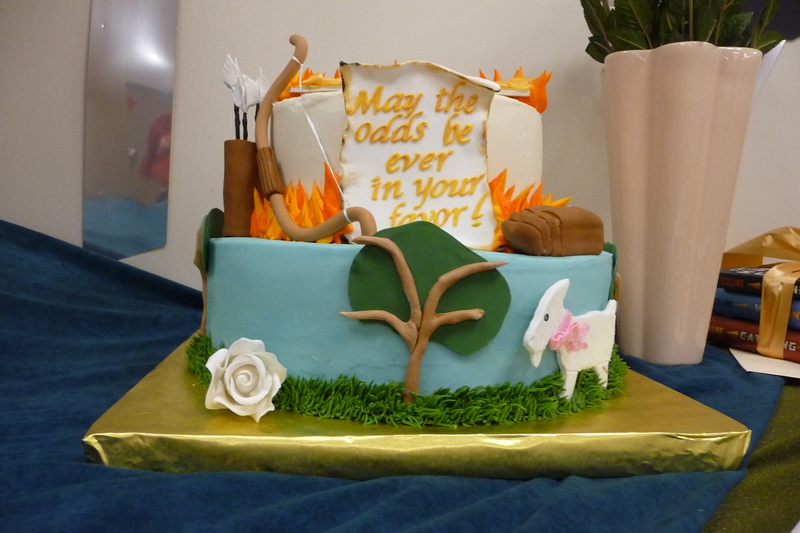 We did have a lot of cake…delicious, ‘Hunger Games’ cake. 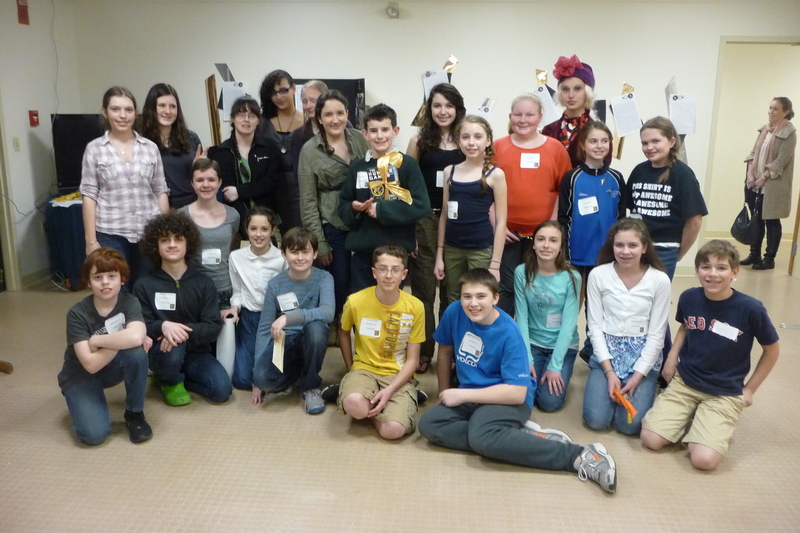 And, we also had 26 enthusiastic HG fans (adults!,too) that went along with the ‘Games’: crossbow competition; rock throwing; Style competition; knot-tying and the Cornucopia Dash. 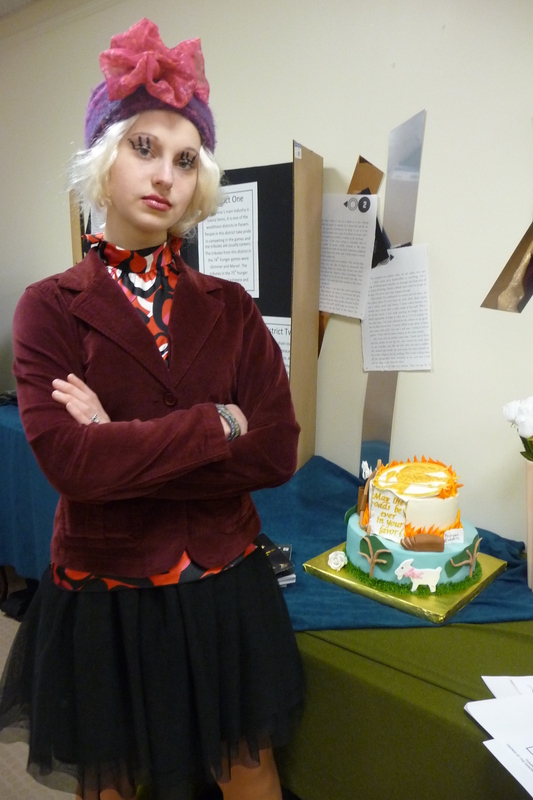 The group was divided into two sets of Tributes, Careers and District 12. Yes, we did have two sets of Prim and Katniss and one Effie Trinket herself. 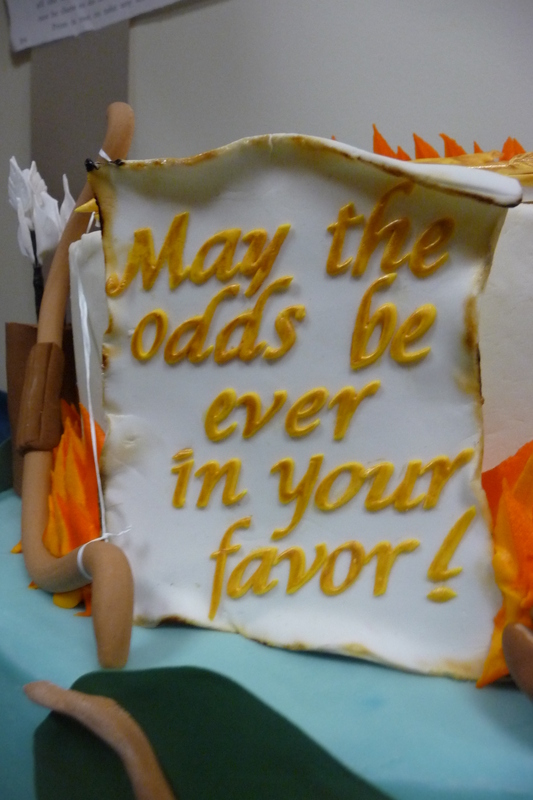 Although the guys were not out to imitate any of the characters, I believe we had a Peeta or two among us. It was great fun. Three pairs of tickets to the Friday night showing at Heritage Theatres were given away as well as our marshmallow crossbows, HG swag and even the bag of beef jerky and, of course, the posters of the Katniss, Peeta and Gale. Having conversed with many people about this book, I must mention that this is title enjoyed by boys/men as well as girls/women. Scholastic’s interview with Suzanne Collins is a great source of how the author came to compose and write this trilogy. Look for it on YouTube or at the Scholastic website. 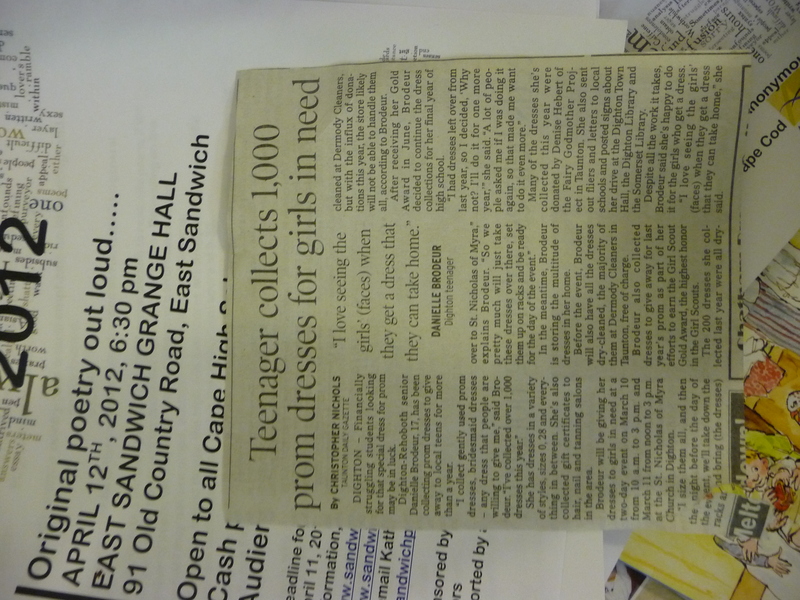 Here are a few more photos from the event and a catchy YouTube “100 Things to Do..”. As we all hope, may the odds be ever in your favor. Random acts of paying it forward. Kudos to this young woman…. 6&7/8ths Book Group takes on a classic…. The group had a great discussion revolving around Roland Smith’s ‘The Cryptid Hunters.’ One of our readers has even met a real life cryptid hunter! It’s the kind of subject that once your stumble across it, the allure of the topic can draw you into it very easily. Generally, the book was acknowledged as a well-written adventure – not deep – but certainly with enough imagery and storyline to keep the reader interested. Next time? It’s ‘White Fang’ written by Jack London, one of our premier American writers. I am really looking forward to this read. 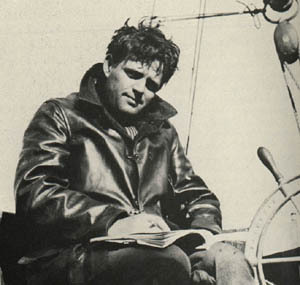 Jack London had such an incredible life, and his stories reflect his experiences. It’s the first ‘classic’ that we will read as a group. Next meeting: Thursday, April 5, 5:15 pm in the Teen Reads area.